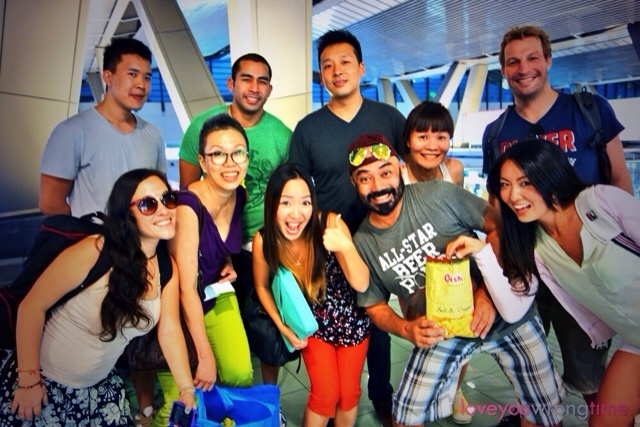 Asian Food Channel’s Amazing Food Challenge – our TV show trailer is finally released! 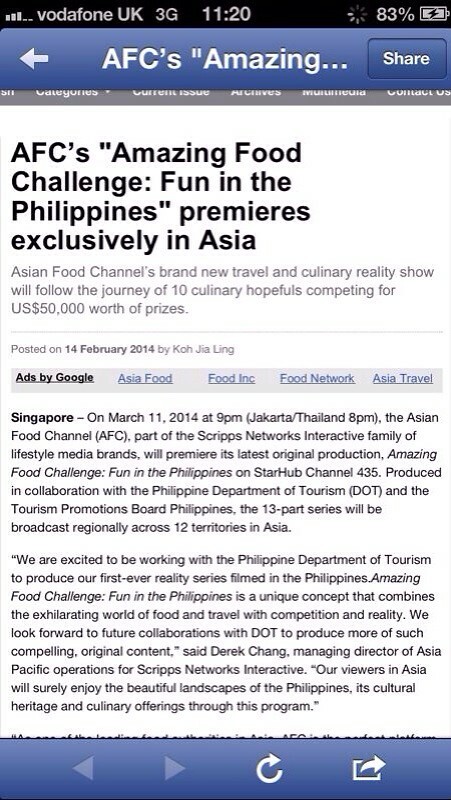 Our Amazing Food Challenge trailer on Asian Food Channel FB page and TV channel is out. Are you as excited to see the show as I am? If you check out the thrilling trailer, you’ll see what I mean! The Amazing Food Challenge was commissioned by the Philippines Tourism Board, and was orchestrated by some of the most brilliant minds in scripting and production from Singaporeans, Malaysians, to Filipinos and even Americans – one of the consulting producers on this show helped with casting and producing on the hit US series ‘Survivor’, so you can only imagine the kind of magic that went into the Amazing Food Challenge! I applied for this show not even expecting to get a reply! What an honour that they ended up choosing little adventurous me, one of 10 total Challengers, out of 5000 other applicants. I’ll update more on my blog in the upcoming weeks on my thoughts and stories from this experience, you know how I love to do that… Plus I really miss my dearest buddies here! Expect only the best in food, travel and adventures – catch the debut of AMAZING FOOD CHALLENGE, 9PM SG Time on Asia Food Channel! Also showing in Brunei, Cambodia, Hong Kong, Indonesia, Malaysia, Mongolia, Philippines, South Korea, Taiwan, Thailand and Vietnam. You should be able to view the full trailer on AFC’s Facebook page HERE. Can’t guess from the trailer what’s going to happen in this show? Trust me, none of us had a clue…!!! New York Might Just Kick Me Out After What I Did This Morning..
Hey I was just trying to make toast! Am really grateful for this chance to live my dream in NY, but I know other people have also wanted to visit NY too. Let me fulfil your dream for you? Tweet, FB post, or Instagram post your NYC bucketlist with hashtag #ESTELLENYDREAMS today and I’ll post some videos doing cool things for you! 🙂 I promise I’ll be the best tourist. PS: This whole video was powered and made possible with a Nokia Lumia 1020. Thanks for helping me to capture my adventures, Nokia! Tweet me @estellekiora #EstelleNYdreams and tell me your NY dream! Hot news for my dearest friends here! Remember the TV show Amazing Food Challenge I filmed in Philippines recently? So excited to be able to officially announce that this incredible travel and food show will be aired on AFC on 11 MARCH 9PM SG time, in 12 territories across Asia (Brunei, Cambodia, Hong Kong, Indonesia, Malaysia, Mongolia, Philippines, Singapore, South Korea, Taiwan, Thailand and Vietnam). Asia Food Channel is owned by Food Network in the US. Article source link from On Screen Asia is HERE. Hosted by celebrity chef Sherston Lian and featuring Philippines’ iconic Roland Laudicio, you can’t even begin to imagine the kind of crazy stuff they gave us to do on this show. We can’t reveal too much about the first episode yet but do catch the debut of Amazing Food Challenge on 11 March 9pm (Singapore Time) on Asian Food Channel, and I’ll post some blogposts in the coming weeks about the behind the scenes stuff too. Looking forward to sharing this incredible on-screen adventure with you! In China, internet addicts get sent to prison. How do I know if I’m addicted to the internet? The internet can be a hero for quick research and keeping in touch with friends, but in other ways, it is like electronic heroin. My Mom actually thinks I’m an internet addict because I’m always on all my social media platforms, interacting, reading, researching, watching, learning, emailing, blogging and all sorts of things, day in and day out. Living my life while putting it online sort of goes hand in hand for me. Some days I head out of the house to run errands, have meetings, play sports and such, so I really don’t think I’m such a basket case right?! The most addictive part of the internet is, I think, YouTube and gaming. One YouTube video can turn into 5 hours of your night. Games on the Playstation/xBox or computer like Sims city can consume lives and spit it back out. I think some people use the internet way more than others, and there’s nothing wrong or right with individual lifestyle choices. Help should only be called if you’re eating fast food and wearing diapers so that you can sit in front of the computer non-stop for 3 days. Dramatic situations call for dramatic solutions. But do you think this approach is evil?